After all we’ve been through it seems amazing, but it’s true. As I’m writing, there are only FIVE condos and ten townhomes currently on the market from McDowell to Lincoln, between the 7′s. We’ve heard the message repeatedly on the news, and more recently the housing recovery story has become endemic. 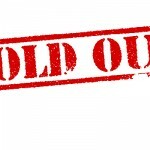 The market is on the way up and demand, especially in the downtown micro market, is clearly outstripping supply. With a seemingly ever increasing number of students, new business, shops, resturants, sports, culture, and most importantly a vastly improved public transport system, Downtown Phoenix has become a very compelling place to live. So what’s next if you want to buy a condo or townhome in downtown? 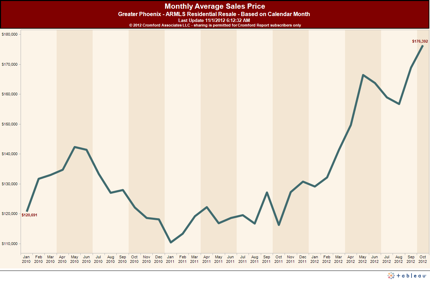 Monthly Average Sales Price for Phoenix. Courtesy of The Cromford Report. On Thursday we saw the first of several potential answers as Urban Commons (the REIT that owns half of Summit at Copper Square) hit the MLS with two condos, almost doubling the available downtown condo market. But there is a price attached. The new listings at the Summit are $60/sf more than the last recorded sales, starting at $200/sf and $285k for a two bedroom home on the 8th floor. If they sell I’d predict up to 70 more to follow over the course of the year as Summit at Copper Square comes to life again and rightfully looses its tag as the last remaining poster child of distressed buildings in downtown. The lack of availability is also driving the two new listings at Orpheum Lofts which are $12 – $40/sf above the previous highest sale, coming in at $135k and $179k respectfully. Pricing is also up at the Townhome at St Croix Villas which is almost $70/sf above the last sale. Expensive? Not really. In fact, the pricing is still well below build cost and will look like a bargain soon as pre-sales start to appear for some really exciting new developments. In the meantime (at least at the time of writing), here’s where you need to go (quickly!) 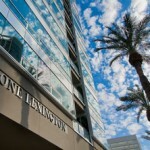 if you really want to be the last to buy at a bargain rate in downtown Phoenix. This article should be fixed: none of those communities are actually townhomes — they’re all condos (with the possible exception of Cathedral, which I don’t know about). Sean, thanks for your comments and entering the murky world of definitions, especially between condos and townhomes. I’m going to stand by the definitions I gave, but I totally accept that St Croix, Artisan Village, and Renaissance Park have all been described by varying sellers and agents as both townhomes and condominiums. Mostly because the developments (arguably) have a mix of both types of homes. As such my blog named condominiums as those homes in developments that had only ever been described as condominiums. 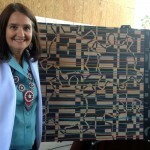 Its where I decided to draw the line and is certainly open for individual interpretation. It might be useful to look further at definitions. They are very confusing. In really simple terms, a townhome is usually accepted as a home that has a roof, and no neighbors above or below. 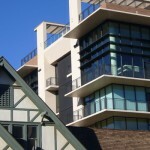 A condominium has neighbors above or below as well as on one or more sides. There is no MLS definition (in fact ARMLS makes it even more confusing – see end comment). The icing on the cake is that both definitions are built on a Condominium Plat. Here are three good examples named in the blog, Portland Two is pure townhome, has been marketed as both townhome and single family home by the developer. Evergreen 9 fits the same definition but has been marketed as condo by the developer and as townhome on the resale market. I’d argue that Cathederal Townhomes are actually condos as they are single level with neighbors above or below, but the developer has named and sold them as townhomes. Definitions are confused even further by ARMLS who insist on calling what everyone calls condos either “loft style homes” or “apartment style homes”. In ARMLS an agent can also call a “townhome” a “patio home” (separating those two definitions is even more fun). The condo/townhome line drawn in the blog is certainly open to individual interpretation, but, I do know two things for sure. 1. A real estate industry that that has grown up with single level tract homes really has to get its housing definitions in order as it moves towards urban living. I welcome that debate and clarification. 2. 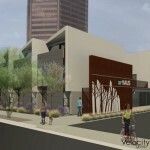 Whatever we call them, we have very very few homes on the market in Downtown Phoenix and a very exciting road ahead.